Alternate Data Streams have been one of the more interesting features of Microsoft's New Technology File System (NTFS). Despite some security drawbacks, the open-ended nature of ADSs make them an extremely powerful Windows resource. The concept of non-monolithic file systems is not new. "File forks" were an integral part of the original Macintosh Hierarchical File System. Apple chose to separate file information into data and resource forks, where the resource fork contains a resource map followed by the resources, or links to resources, needed to use the data. Typical resources would include program code, icons, font specifications, last location of application window, and other file-related meta-data that is not stored in the disk catalog (e.g., file signatures). File forks may be null, and many files contain both forks, the accidental separation of which produces the dreaded "error 39." The Macintosh Resource Manager could control up to 2700 resources per file, though the linear search, single-access control strategy makes managing more than a few hundred resources cumbersome and slow. File forks were standard through MAC OS 9, and are still available in MAC OS X. Based on a Mach micro kernel and derived from FreeBSD, OS X using Apple's HFS+ file system still uses file forks; the alternative UFS (Unix File System) uses .rsrc files instead. Microsoft introduced non-monolithic file structures in their New Technology File System (NTFS) along with their Windows NT operating system. Since the loss of a non-null resource fork renders the data fork useless, Microsoft had to accommodate non-monolithic files for compatibility with Macintosh files and Apple Talk. Among the many innovations in NT, Microsoft ported non-monolithic file structures from the Macintosh world over to the PC. In Microsoft-speak, non-monolithic file structures are called "file streams." One may make reasonable comparisons between the Macintosh data and resource forks and the Microsoft primary and alternate data streams, respectively. In NTFS the "primary" data stream (aka default data stream or unnamed data stream or, simply, file) is called $DATA. A large number of alternate data streams (ADSs) may be associated with a single primary data stream (PDS). We emphasize that ADSs are associated with, and not attached to, primary data streams. The associations are maintained in the Master File Table (MFT), and managed by a variety of application program interfaces (APIs). As a simple illustration, a right mouse click on any NTFS file and subsequent selection of the properties tab, will recover ADS metadata through a standard Windows MFT API. Anything digital can become an ADS: thumbnails and icons, meta-data, passwords, permissions, encryption hashes, checksums, links, movies, sound files, binaries, whatever. We'll return to the "whatever" in a moment. 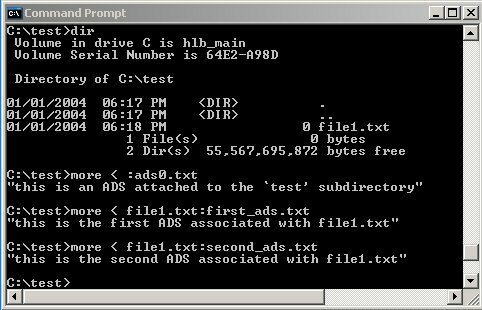 NTFS supports a very large number of ADSs. The Purdue COAST project estimated an upper bound of 6748 ADSs per primary data stream on Windows NT 4. Since ADSs are separate files, they appear hidden from applications that call routine Windows APIs. The use of ADS is completely transparent to standard Windows file management tools - it's as if they don't exist. This includes such key system applications as Windows Explorer and Task Manager, and core command line executables like DIR. The normal data stream ADS API syntax in Windows NT/W2k/XP is < filename>:<ADSname>:<ADStype> (where ADStype is optional). ADSs form a tree structure that has a maximum depth of 1. The decision to prevent nesting of ADSs seems to us to be an unnecessarily arbitrary and short-sighted limitation. The best way to get a feel for ADS is with a little hands-on experience. Our example may seem clumsier than necessary at first, but it has simplicity on its side because we can complete the entire demonstration within a single DOS command prompt window. This exercise was run on Windows XP Pro with administrative privileges. Similar results would result if it were run under Windows 2000 or even Windows NT, with slight adjustments to the syntax. reveals an empty directory. How can that be? This is where the NTFS sleight-of-hand comes in: ADS are hidden to Windows applications that rely on the standard MFT APIs. "DIR" is one such example, as is Windows Explorer and the file properties box. In the example above, since the PDSname field is null, <ads0.txt> is by default associated with the subdirectory name in the MFT. Directories in Windows are themselves files that reference other files. Note that we never created <file1.txt> to begin with. Since the colon is not a legitimate filename character, the Windows command processor understands that the data to be echoed is intended for the associated ADS. Since the ADS has to be associated with something in the MFT, Windows conveniently creates an empty file named <file1.txt> for the association. In Microsoft-speak, we think of this as a single file where <file1.txt> is the primary/default/unnamed data stream, and a named stream labeled <first_ads.txt>. and observe that nothing has changed. We still have an empty file, <file1.txt>, in a directory consisting of 0 bytes. Your results should look like those in Figure 1. The remaining 6746 repetitions are left to the reader. As we said, ADSs may contain anything: text, images, sound and video files, - anything. The most interesting type of "anything" is the binary executable. If you're up for the challenge, we'll attach an executable to an empty text file. In this case we're assuming that the Windows calculator is stored on your XP computer as C:\windows\system32\calc.exe. If not, create a path to the harmless executable of choice. You should see the Windows calculator pop up on your screen. A directory listing still reveals only primary data streams. 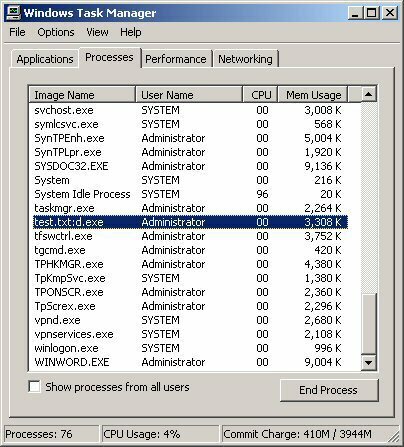 The executable is entirely hidden, but very much there - and obviously active - as can be confirmed by looking at the active processes listing under Windows Task Manager (hit <CTL><ALT><DEL> simultaneously). One can see that with minimal effort one can sufficiently mask the hidden executable so that its function is obscured. Of course, masking an executable by just changing the filename is neither clever nor particularly deceptive, so a hacker might add the requisite stealth by invoking the native Windows Scripting Host with the control parameters set to execute files with non-executable file extents. In this way one could rename <trojan.exe> as something innocuous like <help.fil>, and execute it with WSH. It is interesting to note that prior to Windows XP, the ADS didn't even appear in the process listing. Had we hidden the ADS behind something innocuous like <cmd.exe> or <notepad.exe>, the execution of the ADS would be undetected. The hiding of the function behind an innocuous appearing executable is akin to Internet scams where the unsuspecting are lured to spoofed Websites that appear harmless while actually harvesting personal or private information - a technique called "phishing." For lack of a better term, we may think of planting "hostile" executables in ADS as "file phishing"- creating an environment where things are not as they appear. Before we proceed, let's clean up your computer. ADSs can only be deleted if their associated primary data stream is deleted, so once you're done experimenting, erase all of the files in your test directory, go up one directory and remove the directory itself, or simply erase the entire <test> directory with Windows Explorer. At this point you're back where you started, no worse for wear. To understand ADS, one has to investigate the way the Windows MFT works. The MFT is a relational database where the records correspond to files and the columns to file attributes. Following 16 records of metadata files, there is at least one MFT record for each file and folder (subdirectory) on all hosted disk volumes. All records are 1kb in size, allowing the data and attributes of very small files or folders to be stored in an MFT record itself. Larger files and folders are referenced by pointers within their records. Folders are externally organized as B-trees. Each record contains basic file attributes relating to date and time stamps, permissions, filename and extent, security descriptors, and so forth. The utility of the MFT results from the fact that it is set up to automatically use external pointers for all data that cannot fit within the 1k record. Having this in place allows virtually unrestricted, scalable control over file management. All data streams (regardless of whether they're primary or alternate) maintain all of the necessary information for the Windows APIs to manipulate them: e.g., allocation size, actual data length, whether they're compressed or encrypted, and so forth. Such being the case, the proliferation of data streams involves little more than the proliferation of pointers within the MFT. The only fly in the ointment is that the ADSs cannot be nested, which means that any ADS file organization beyond a 1-level deep tree would have to be accomplished at the applications layer. One final word on MFTs and ADSs. As we indicated, the low-level Windows APIs (e.g., CreateFile, DeleteFile, ReadFile, WriteFile) were designed to treat all data streams the same - ADSs or PDSs . Under NTFS, ADS support is completely transparent at that level. The weakness is that the higher-level utilities (e.g., DIR, Windows Explorer, Task Manager) were not intended to support ADS. This is where the truly baroque nature of Microsoft's ADS design logic rears its ugly head. One can use the low-level APIs to manipulate ADSs easily - but the higher-level utilities conceal their presence. From the end-user's perspective, it's hard to delete a data stream without first being able to find it! Fortunately there are third-party utilities such as Lads, ScanADS, Streams, and Crucial that help locate ADS by working directly with the low-level APIs (especially, the "backup_" functions). Figure 3 illustrates their use on our <test> directory after we completed the experiment above. Note that Streams requires a separate test for folder ADS (remove the "-s" parameter). Crucial has a GUI interface and only scans entire drives, so it won't be shown here. Figure 3: Typical ADS reporting utilities at work. A casual Google search on "alternate data streams" will yield several thousand hits, most of an alarmist nature. This is unfortunate in many ways, because the power of ADSs has yet to be realized. While it is true that there is malware that takes advantage of ADSs (e.g., W2k.stream), that malware has not proven to be as destructive as the more mainstream varieties that rely on buffer overflows, NetBIOS and RPC vulnerabilities, session hijacking, address spoofing, etc. As a datapoint, all W2k.stream threat vectors were assessed "low" by Semantec (www.sarc.com/avcenter/venc/data/w2k.stream.html). What created most of the alarm was the "hidden" nature of ADS combined with the absence of Microsoft utilities that supported direct access and control within native file utilities - but, then, that wasn't why Microsoft built ADS into NTFS in the first place. The mere mention a "hidden feature" to anyone with even a slight anti-Microsoft bias is guaranteed to produce an animated response. Unfortunately, Microsoft added fuel to the fire by failing to include a "display ADS" checkbox as a Windows Explorer configuration option and direct ADS control at the utility level. Most users wouldn't be bothered with ADS management, but full file disclosure would have been comforting to those prone to anxiety attacks. The facts are less alarming than the several thousand Google hits might lead us to believe. While it is true that ADS could be used as a conduit for malware executables, so can email and their attachments. Further, modern anti-virus scanners routinely scan for malware in all Windows data streams, including ADS, so the risk of intrusion should be no greater with ADS than PDS. The same is true for covert channeling. ADS could be used for that purpose, but so could the options field in a normal ICMP packet. With the ease that malware such as Loki conducts encrypted covert data channeling at the IP level, why would a hacker mess with the applications layer? The claim that ADSs are difficult to delete is equally misleading. ADS file space gets re-allocated in just the same way that PDS and directory space does. File wiping products such as Cyberscrub (http://www.cyberscrub.com/) even include ADS "scramblers" for extra safety. By any reasonable measure, ADS vulnerability has been over-stated. There is no question that ADSs are under-utilized in Windows. Like major software houses before them, Microsoft felt compelled to opt in favor of backward compatibility. To give two examples, to use <desktop.ini> files to parse the contents of a directory and <.tmp> files to hold transitory data, seem retrogressive at best when ADS could have accomplished the same thing in a far more straightforward manner. After all, neither file type has any meaning apart from the associated directory or primary data stream anyway, so the ADS is the natural way to handle them. But, that would have meant that such information could not be shared with Windows platforms with FAT16 and FAT32 file systems. To hobble the OS is less costly than dealing with 40 million additional hits at the help desk. But the most unfortunate aspect of ADS is that the negative press and exaggerated claims of vulnerability have created such bad Karma that the true potential of ADS may never be realized. A good, simple overview of Macintosh file forks may be found on the Apple Website at developer.apple.com/documentation/mac/Files/Files-14.html. The Microsoft MSDN Library (msdn.microsoft.com/library/) is a reliable source of information on Windows NT operating systems, including APIs and ADS. Detailed documentation on NTFS may be found on the Microsoft Technet site (www.microsoft.com/technet/). The 1998 overview of NTFS by Richter and Cabrera in the Microsoft Systems Journal at www.microsoft.com/msj/1198/ntfs/ntfs.aspx is still worth reading. This article also has links to sample code. The general-purpose Windows utility that is ideal for ADS manipulation is <cp.exe>, variations of which may be found in either the Windows Resource Kit or from the Sourceforge.net GNU utilities library at unxutils.sourceforge.net, the latter being free. Two good sources for the nuts-and-bolts of ADS programming are Dino Esposito's "A Programmer's Perspective on NTFS 2000 Part1: Stream and Hard Link" at msdn.microsoft.com/library/en-us/dnfiles/html/ntfs5.asp?frame=true, and Eugene Kaspersky and Denis Zenkin's, NTFS Alternate Data Streams, Document 19878 in Windows and .NET Magazine (http://www.winnetmag.com/). Esposito's article contains an interesting code fragment that adds a new property page with stream information. The Code Project (www.codeproject.com/csharp/CsADSDetectorArticle.asp) also contains useful code fragments. Effective ADS detectors include ScanADS (www.securiteam.com/tools/5JP0C2KAAQ.html), LADS (www.heysoft.de/Frames/f_sw_la_en.htm), CrucialADS (http://www.crucialsecurity.com/), and Streams (www.sysinternals.com/ntw2k/source/misc.shtml).